“That’s my living,” said Robert, who has logged more than two decades as a truck driver. On August 27, Robert knew the remnants of Hurricane Harvey meant the forecast for Houston was messy and even called Virginia, his wife of 27 years, to let her know. “I told her, ‘Something’s going on here. Pray for me,'” Robert remembered. Virginia did what she always does on Sundays: she headed up to New Hope Missionary Baptist Church in Possumneck to teach Sunday school. That Sunday, the lessons called for extra prayers. While she was getting settled in church, Robert was getting into trouble on the frontage road of the North Sam Houston Tollway near Hardy Toll Road. As the rain poured down, the water just kept rising. Before Robert knew it, his truck was stuck in water deep enough to fill his cab. “The water hit me,” he said. Robert, who had dropped his phone in the water, set his attention on finding it, distracting him from the life-threatening situation in which he’d found himself. At the same time Robert was dealing his dilemma, KHOU 11 News was coping with its own emergency. Flooding along Buffalo Bayou started pouring into the station before sunrise. By 7 a.m., staff moved to the second floor to continue providing viewers with the latest on the floods. When water started gushing through the station’s main and back doors, managers made the decision to evacuate the building. Reporter Brandi Smith flagged down a Harris County Sheriff&#39;s Office truck to rescue Robert Roberson. While the KHOU 11 staff at the station scrambled to a backup location, the last live shot punched up was from the North Sam Houston Tollway, just on the other side of the overpass from where Robert’s truck was stuck. KHOU 11 reporter Brandi Smith and photographer Mario Sandoval were showing viewers what they could, including high water on the main lanes, the frontage road completely underwater. The pair moved to the other side of the overpass, which is when Sandoval pointed out the truck and Smith noted the lights were on, as were the windshield wipers. The next observation: there was movement inside. It was Robert who was still frantically looking for his phone. Smith and Sandoval rushed to the railing of the overpass, warning Robert to stay inside his truck and to not try to swim to safety. When a Harris County Sheriff’s Office truck towing a boat drove by, Smith flagged it down. 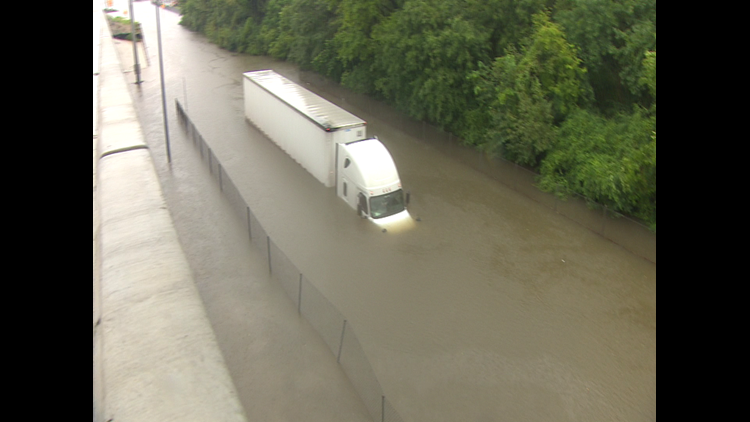 “There’s a truck driver stuck here in about 10 feet of water,” she told the deputies. As they got out to assess the situation, one deputy told Smith a truck driver died at the same intersection in 2016. The pair hustled to get the airboat in the water, which seemed as though it took a lifetime. In the end, it was just in time to save a life. Robert says, just as he finally reached his phone, the boat arrived outside the passenger side window of his truck. Two Harris County Sheriff&#39;s deputies were able to launch an airboat and pull Robert Roberson out of his flooded truck. 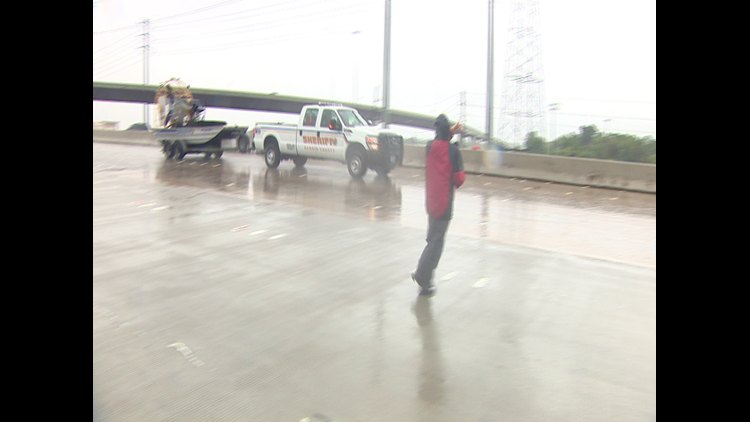 KHOU 11 viewers weren’t able to see the rescue live, though; the signal dropped off before deputies reached Robert. Luckily, Sandoval was rolling almost the entire time, which allowed Smith to share the video on Facebook afterward. In that video, Smith and Sandoval rushed to meet Robert as deputies dropped him off. “Sir, thank God you’re OK. How does feel to be on land?” Smith asked. Now back on solid ground, Robert's next few days were as fluid as the fast-moving water that trapped his truck. 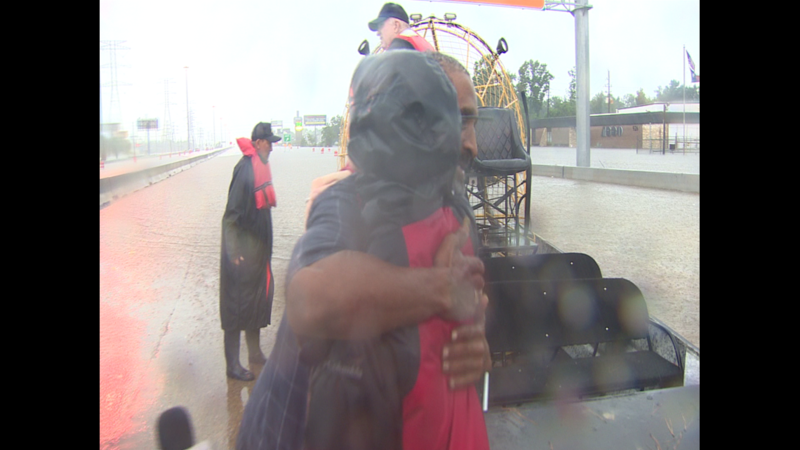 He ended up at the shelter at the George R. Brown Convention Center, surrounded by the flood's victims. By Friday, his company sent a ride to Chicago, where he picked up his new rig, and on Sunday, a week after she sent up those prayers, Virginia saw them deliver right back in Durant. “I hugged him and thanked God because it could have been another way,” she says. A couple days later, her arms extended for more hugs as the Roberson's welcomed Smith and Sandoval to their Mississippi home. Sitting on their patio, Virginia recalled what it was like watching Robert's rescue online. “It really kind of got me to see what he went through, to see him really down there in that water like that,” she said. Virginia Roberson, Robert&#39;s wife of 27 years, says she always prays when he heads out on the road. Outfitted with his new truck, a new Bluetooth headset and new GPS system, Robert was ready to hit the road. He’ll get back to the pavement that claims part of his heart, while the other half patiently waits in Durant, praying for him to return. “I have to pray because I know prayer can go where we can’t go,” Virginia said. KHOU 11 News reporter Brandi Smith hugs truck driver Robert Roberson outside his home on Sept. 5, 2017, in Durant, Miss. Truck driver Robert Roberson outside his home on Sept. 5, 2017, in Durant, Miss. KHOU 11 News reporter Brandi Smith, truck driver Robert Roberson and his wife, Virginia, watch video of his rescue during Harvey, Sept. 5, 2017, in Durant, Miss. KHOU 11 News photographer Mario Sandoval records an interview between reporter Brandi Smith and truck driver Robert Roberson on Sept. 5, 2017, in Durant, Miss. Truck driver Robert Roberson and his wife, Virginia, at their home on Sept. 5, 2017, at their home in Durant, Miss. KHOU 11 News photographer Mario Sandoval records as reporter Brandi Smith gives truck driver Robert Roberson a new GPS and headset as his wife, Virginia, looks on. KHOU 11 News reporter Brandi Smith talks with truck driver Robert Roberson on Sept. 5, 2017, outside his home in Durant, Miss. Truck driver Robert Roberson and his wife, Virginia, outside their home on Sept. 5, 2017, in Durant, Miss. 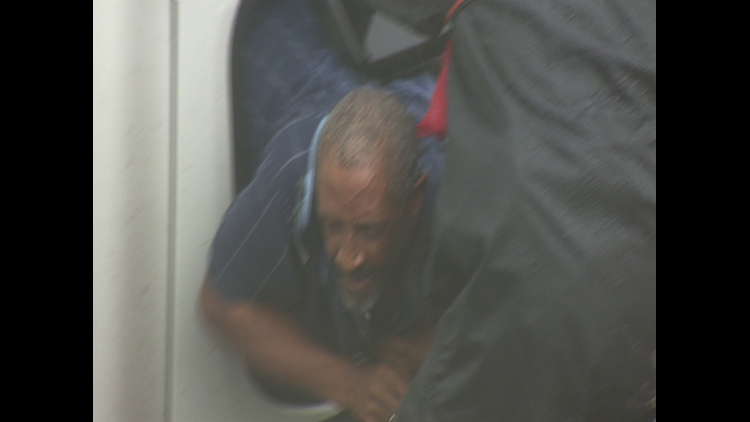 Truck driver Robert Roberson describes being trapped in his semi in floodwaters during Harvey before KHOU 11 News reporter Brandi Smith and photographer Mario Sandoval, as well as Harris County Sheriff's deputies came to his rescue. Truck driver Robert Roberson and his wife, Virginia, watch a clip of KHOU 11 News reporter Brandi Smith and photographer Mario Sandoval helping rescue him in Harvey floodwaters. They spoke outside his home on Sept. 5, 2017, in Durant, Miss. KHOU 11 News reporter Brandi Smith speaks with Virginia Roberson, wife of Robert Roberson, outside her home on Sept. 5, 2017, in Durant, Miss. KHOU 11 News reporter Brandi Smith speaks with Virginia Roberson, wife of Robert Roberson, the truck driver Smith and photographer Mario Sandoval helped rescue during Harvey, at their home on Sept. 5, 2017, in Durant, Miss. KHOU 11 News reporter Brandi Smith and photographer Mario Sandoval meet with Robert Roberson, the truck driver they helped rescue during Harvey, and his wife, Virginia, at their home on Sept. 5, 2017, in Durant, Miss. Robert Roberson exits his truck after speaking with KHOU 11 News reporter Brandi Smith on Sept. 5, 2017, in Durant, Miss. Robert Roberson enters his truck before speaking with KHOU 11 News reporter Brandi Smith on Sept. 5, 2017, in Durant, Miss. Robert Roberson's truck on Sept. 5, 2017, in Durant, Miss. KHOU 11 News reporter Brandi Smith speaks with Robert Roberson, a truck driver she helped rescue, inside his truck on Sept. 5, 2017, in Durant, Miss. Truck driver Robert Roberson hugs KHOU 11 News photographer Mario Sandoval on Sept. 5, 2017, in Durant, Miss. Truck driver Robert Roberson at his home on Sept. 5, 2017, in Durant, Miss. Robert Roberson inside his truck on Sept. 5, 2017, in Durant, Miss. Robert and Virginia Roberson's church in Possumneck, Miss. Robert Roberson in his truck on Sept. 5, 2017, in Durant, Miss. The old Durant railroad station on Sept. 5, 2017, in Durant, Miss. KHOU 11 News reporter Brandi Smith hugs Virginia Roberson, wife of truck driver Robert Roberson, on Sept. 5, 2017, in Durant, Miss. A photo from Robert and Virginia Roberson's wedding. KHOU 11 News reporter interviews Robert Roberson inside his truck on Sept. 5, 2017, in Durant, Miss. Robert Roberson outside his truck on Sept. 5, 2017, in Durant, Miss. Robert Roberson's truck on Sept. 5, 2017, on Durant, Miss. The old railroad station in Durant, Miss. KHOU 11 News photographer Mario Sandoval outside of Robert and Virginia Roberson's church on Sept. 5, 2017, in Possumneck, Miss. KHOU 11 News photographer Mario Sandoval outside the old railroad station in Durant, Miss. Outside of Robert and Virginia Roberson's church in Possumneck, Miss. KHOU 11 News photographer Mario Sandoval films Robert Roberson getting into his truck on Sept. 5, 2017, in Durant, Miss. Truck driver Robert Roberson and KHOU 11 News photographer Mario Sandoval outside of Roberson's truck on Sept. 5, 2017, in Durant, Miss. KHOU 11 News reporter Brandi Smith speaks with Virginia Roberson, wife of Robert Roberson, the truck driver Smith and photographer Mario Sandoval helped rescue, Sept. 5, 2017, outside the Robersons' home in Durant, Miss. Downtown Durant, Miss., on Sept. 5, 2017. KHOU 11 News reporter Brandi Smith interviews Robert Roberson, the truck driver she and photographer Mario Sandoval helped rescue during Harvey, on Sept. 5, 2017, in Durant, Miss. KHOU 11 News photographer Mario Sandoval and Virginia Roberson, wife of Robert Roberson, watch video of Robert's interview with reporter Brandi Smith inside his truck on Sept. 5, 2017, in Durant, Miss. A car wash in downtown Durant, Miss. KHOU 11 News photographer Mario Sandoval speaks with truck driver Robert Roberson outside his home on Sept. 5, 2017, in Durant, Miss. KHOU 11 News photographer speaks with truck driver Robert Roberson outside his home on Sept. 5, 2017, in Durant, Miss. KHOU 11 News reporter Brandi Smith speaks with truck driver Robert Roberson and his wife, Virginia, outside their home on Sept. 5, 2017, in Durant, Miss. KHOU 11 News reporter Brandi Smith speaks with truck driver Robert Roberson and his wife, Virginia, outside his home on Sept. 5, 2017, in Durant, Miss. Virginia Roberson, wife of truck driver Robert Roberson, speaks with KHOU 11 News reporter Brandi Smith, on Sept. 5, 2017, in Durant, Miss. Truck driver Robert Roberson and his wife, Virginia, watch video of his rescue with KHOU 11 News reporter Brandi Smith on Sept. 5, 2017, at the Robersons' home in Durant, Miss. Truck driver Robert Roberson watched footage of his rescue with KHOU 11 News reporter Brandi Smith on Sept. 5, 2017, at his home in Durant, Miss. KHOU 11 News photographer Mario Sandoval shoots an interview with reporter Brandi Smith, truck driver Robert Roberson and his wife, Virginia, Sept. 5, 2017, in Durant, Miss. KHOU 11 News reporter Brandi Smith interviews truck driver Robert Roberson and his wife, Virginia, Sept. 5, 2017 in Durant, Miss. KHOU 11 News photographer Mario Sandoval records as reporter Bradi Smith, truck driver Robert Roberson and his wife, Virginia, watch Robert's rescue during Harvey, Sept. 5, 2017, in Durant, Miss. KHOU 11 News reporter Brandi Smith talks with truck driver Robert Roberson and his wife, Virginia, as they watch video of Robert's rescue during Harvey, Sept. 5, 2017, in Durant, Miss. 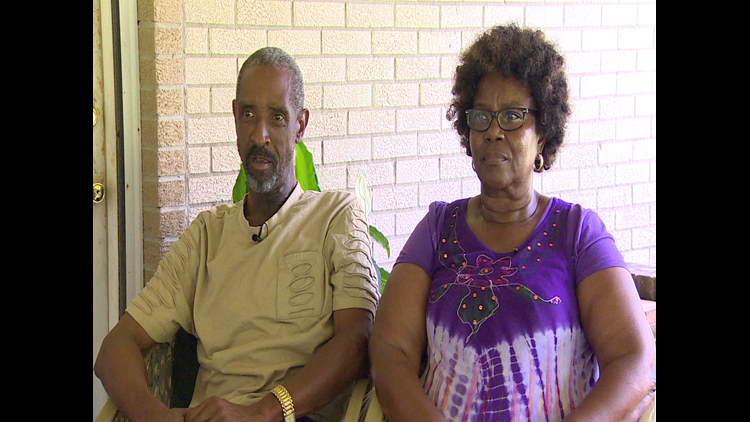 KHOU 11 News reporter Brandi Smith interviews truck driver Robert Roberson and his wife, Virginia, at their home on Sept. 5, 2017, in Durant, Miss. KHOU 11 News reporter Brandi Smith and truck driver Robert Roberson watches video of his rescue during Harvey, Sept. 5, 2017, in Durant, Miss. KHOU 11 News reporter Brandi Smith carries a bag of gifts for Robert Roberson, the truck driver she and photographer Mario Sandoval helped resuce, as Roberson's wife, Virginia, looks on. KHOU 11 News reporter Brandi Smith presents gifts to truck driver Robert Roberson as his wife, Virginia, looks on, Sept. 5, 2017, in Durant, Miss. Truck driver Robert Roberson and his wife, Virginia, are interviewed on Sept. 5, 2017, at their home in Durant, Miss. KHOU 11 News reporter Brandi Smith, truck driver Robert Roberson and his wife, Virginia, watch video of Robert's rescue during Harvey, Sept. 5, 2017, in Durant, Miss. Truck driver Robert Roberson and his wife, Virginia, are interviewed on Sept. 5, 2017, in Durant, Miss. KHOU 11 News reporter Brandi Smith talks with truck driver Robert Roberson on Sept. 5, 2017, at his home in Durant, Miss. Truck driver Robert Roberson describes the moments he was rescued from Harvey floodwaters with the help of KHOU 11 News reporter Brandi Smith and photographer Mario Sandoval, Sept. 5, 2017, in Durant, Miss. Virginia Roberson, wife of truck driver Robert Roberson, talks with KHOU 11 News reporter Brandi Smith on Sept. 5, 2017, in Durant, Miss. Truck driver Robert Roberson and his wife, Virginia, are interviewed Sept. 5, 2017, at their home in Durant, Miss. KHOU 11 News reporter Brandi Smith interviews truck driver Robert Roberson on Sept. 5, 2017, in Durant, Miss. KHOU 11 News reporter Brandi Smith gives truck driver Robert Roberson a new GPS and headset after he lost in the flood during Harvey as his wife, Virginia, looks on. KHOU 11 News photographer Mario Sandoval shoots an interview with reporter Brandi Smith, truck driver Robert Roberson and his wife, Virginia, Sept. 5, 2017, at the Robersons' home in Durant, Miss. KHOU 11 News reporter Brandi Smith talks with truck driver Robert Roberson and his wife, Virginia, Sept. 5, 2017, at their home in Durant, Miss. KHOU 11 News reporter Brandi Smith interviews truck driver Robert Roberson and his wife, Virginia, Sept. 5, 2017, at their home in Durant, Miss. Truck driver Robert Roberson at his home in Durant, Miss., on Sept. 5, 2017. KHOU 11 News reporter Brandi Smith hugs Robert Roberson, the truck driver she helped rescue, Sept. 5, 2017, at his home in Durant, Miss., as his wife, Virginia, looks on. KHOU 11 News photographer Mario Sandoval talks with truck driver Robert Roberson and his wife, Virginia, on Sept. 5, 2017, at their home in Durant, Miss. KHOU 11 News reporter Brandi Smith and Robert Roberson, the truck driver she helped rescue during Harvey, watch video of his rescue, Sept. 5, 2017, in Durant, Miss. Truck driver Robert Roberson and his wife, Virginia, at their home on Sept. 5, 2017, in Durant, Miss. KHOU 11 News reporter Brandi Smith presents truck driver Robert Roberson with a new GPS and headset as his wife, Virginia, looks on, Sept. 5, 2017, in Durant, Miss. Truck driver Robert Roberson and his wife, Virginia, speak with KHOU 11 News reporter Brandi Smith on Sept. 5, 2017, at their home in Durant, Miss. KHOU 11 News reporter Brandi Smith hugs Virginia Roberson, wife of truck driver Robert Roberson, on Sept. 5, 2017, outside the Robersons' home in Durant, Miss. KHOU 11 News photographer Mario Sandoval records an interview with reporter Brandi Smith and truck driver Robert Roberson on Sept. 5, 2017, in Durant, Miss. KHOU 11 News reporter Brandi Smith interviews truck driver Robert Roberson and his wife, Virginia, on Sept. 5, 2017, outside their home in Durant, Miss. KHOU 11 News reporter Brandi Smith speaks with Virginia Roberson, wife of truck driver Robert Roberson, outside their home on Sept. 5, 2017, in Durant, Miss. KHOU 11 News reporter Brandi Smith talks with Robert Roberson, the truck driver she helped save during Harvey floodwaters, on Sept. 5, 2017, in Durant, Miss. KHOU 11 News reporter Brandi Smith hugs Robert Roberson, the truck driver she helped save from floodwaters during Harvey, on Sept. 5, 2017, in Durant, Miss. KHOU 11 News reporter Brandi Smith talks with truck driver Robert Roberson and his wife, Virginia, on Sept. 5, 2017, outside their home in Durant, Miss. KHOU 11 News reporter Brandi Smith talks with Robert Roberson, the truck driver she helped rescue from floodwaters during Harvey, on Sept. 5, 2017, outside his home in Durant, Miss. KHOU 11 News reporter Brandi Smith interviews truck driver Robert Roberson and his wife, Virginia, outside their home on Sept. 5, 2017, in Durant, Miss. KHOU 11 News reporter Brandi Smith speaks with truck driver Robert Roberson and his wife, Virginia, on Sept. 5, 2017, outside their home in Durant, Miss. KHOU 11 News reporter Brandi Smith interviews truck driver Robert Roberson on Sept. 5, 2017, outside his home in Durant, Miss. KHOU 11 News photographer Mario Sandoval records and interview with reporter Brandi Smith, truck driver Robert Roberson and his wife, Virginia, on Sept. 5, 2017, in Durant, Miss. KHOU 11 News reporter Brandi Smith interviews truck driver Robert Roberson on Sept. 5, 2017, outside his home on Durant, Miss.